While walking along a dock in Deltaville, Virginia over a year ago, I made a new friend. I saw a very attractive, new motor yacht with an equally attractive lady aboard. I paused and complimented her on the vessel. She introduced herself as the Captain of the boat and we chatted briefly. Soon we acknowledged having numerous friends in town and she invited me aboard to view her new acquisition, a custom built 2015 Tiara 31. 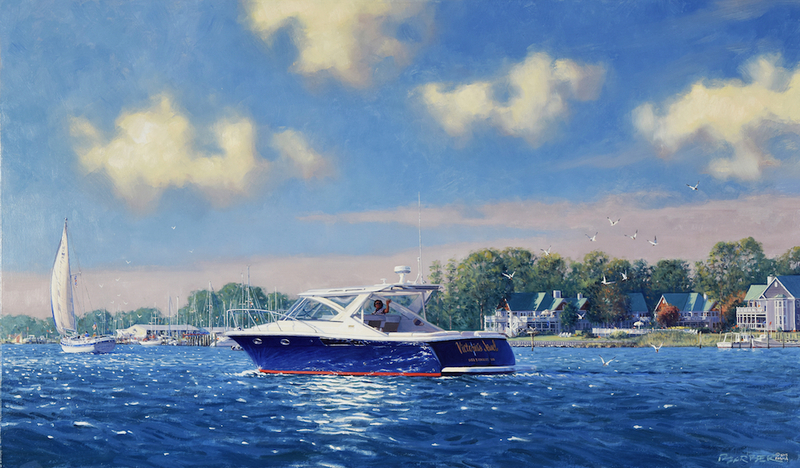 I was impressed with the boat, complimented my host again and departed after a brief conversation about my painting a portrait of her Victoria’s Jewel some time in the future. Months later she contacted me and we made plans to do such a painting. 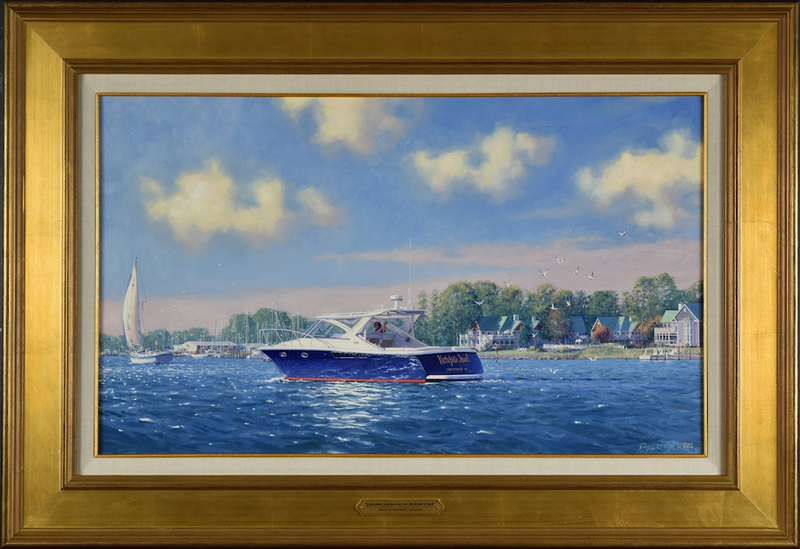 We determined that Victoria’s Jewel would be the primary subject with her previous vessel, a Morgan 41 sloop [a classic, single-masted sailboat for you landlubbers] and on the shore her condo home on Jackson Creek, Deltaville would be visible. After receiving photos of her sloop and several visits to Victoria in Deltaville during which I made photos of Jewel from a following “chase boat” we had all that was needed for the painting. I did a series of sketches of the proposed scene and once her favorite was selected I did a small oil study to illustrate composition and coloration. With Victoria’s OK on the study I began the major oil. In the final piece we see the sailboat Victory ahead on the left with Victoria at the helm and her beloved, late husband and Co Captain Oliver in the cockpit. And at the wheel of Victoria’s Jewel we see Captain Victoria and her condo on the shore. She and I enjoyed the opportunity to become friends and to collaborate on this great project. As I’ve said so many times, the opportunity to meet and work with these wonderful people is as important to me as the making of the paintings. Victoria has graciously offered to share her experiences with any of you who are interested in having a custom painting created and I will happily provide an introduction.